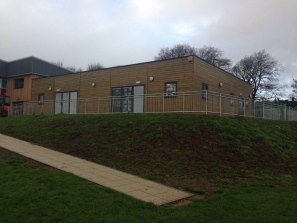 Located in Bradford and commissioned by the Local Authority, this purpose built 5 bay Modular Classroom Building now provides a modern, safe and much needed 'classroom block' at the school. This Prefabricated Classroom Building provides a total floor area of 188 sq. m and incorporates a classroom area providing 130 sq. m of teaching space, a fully equipped and DDA compliant disabled toilet, two childrens toilets, a kitchen area, an entrance lobby with coat hooks and slatted timber bench seating and a separate plant room, all c/w heavy-duty aluminium external doors. The classroom is fitted with a centrally located 45dB folding partition wall enabling the teaching area to be separated into two individual classrooms. A suspended ceiling system is provided throughout at 2.70m above f.f.l. c/w inset light fittings and a heat/cool air conditioning system keeps the fully carpeted classrooms at a constant temperature whilst the children concentrate on their studies. Externally, the walls of this Modular Classroom Building are clad with treated horizontal larch timber boards whilst the roof is constructed with a concealed mono-pitch flat roofing system c/w hard wearing 'Hypalon' blanket.